This book is about a little boy who wants more than anything in the world for his grandmother to make him a pair of white mittens for his birthday. His grandmother reluctantly makes him the mittens. However, it was on the condition that he does not lose them. Tragically, he drops one of them in the forest. Then several different kinds of wild animals snuggle up within the mitten to get warm. 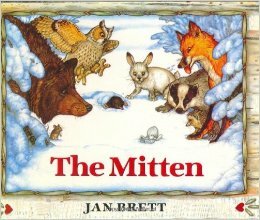 Eventually all of the animals leave the mitten. Much to the pleasure of the boy, he finds the lost mitten. This is a wonderful story. It could be used in the classroom accompanied by an actual reenactment of the story. I have seen it done before and the children absolutely loved it. This book has a lexile level of 800L. So for recreational reading students should be in 1st or 2nd grade. It could be used as a classroom reading as well for younger students.